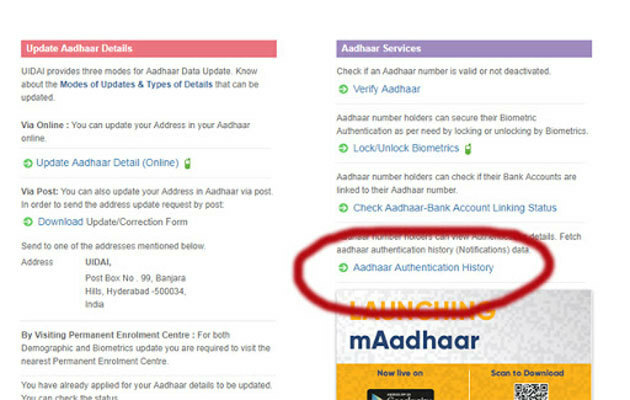 Do you know you can find out when and where your Aadhaar card was used for authentication? Since Aadhaar is used for authentication to avail of several services, you might be worried about its misuse. The website of the Unique Identification Authority of India (UIDAI), the body that manages Aadhaar, has the provision of checking where and when your Aadhaar was used. 3. Click on ‘Generate OTP’. 5. You will see options to choose the period of information and the number of transactions. Write your OTP and click on ‘Submit’. 6. You will see date, time and type of all Aadhaar authentication requests made in the period you had chosen. However, the page won’t show who made the requests. If you find something suspicious, you can even lock your Aadhaar information online and unlock it whenever you want to use it. And while you are figuring that out, don’t forget the linking deadlines are fast approaching. You should visit the Income Tax website, enter your PAN and Aadhaar details, and complete the authentication process. You can link your bank account with your Aadhaar at a bank branch, or using Internet or mobile banking facilities. To do it through Internet banking, log in to your online banking account and click on the ‘Update Aadhaar’ link. Enter your Aadhaar details and submit it. Use the OTP sent to your registered number to complete the process. CAMS and Karvy Computershare offer an online facility for linking your Aadhaar to your mutual fund account. Go to the CAMS or Karvy website and click on the ‘Link Your Aadhaar’ tab. Follow the steps to fill in the form and submit it, then enter the OTP generated and sent to your registered mobile number to complete the linking process.